America First: Tell Congress to WITHDRAW the United States from the United Nations! Take action now and urge your U.S. Representative and Senators to end the United States' membership in the United Nations by supporting and passing the American Sovereignty Restoration Act. REPEAL the United Nations Participation Act of 1945. REPEAL the United Nations Headquarter Agreement Act. TERMINATE financial contributions to the United Nations from the United States. WITHDRAW United Nations presence in United States government facilities and repeal diplomatic immunity. REPEAL United States membership and participation in the United Nations educational, scientific, and cultural organizations. REPEAL the United Nation Environment Program Participation Act of 1973. REPEAL United States participation in the World Health Organization. REPEAL involvement in United Nations conventions and agreements. President Donald Trump has made it very clear that he is determined to serve "America First." That's why it's crucial that citizens demand members of the House and Senate to pass the American Sovereignty Restoration Act and place it on the President's desk. *Read the American Sovereignty Restoration Act and review co-sponsors here. The U.N. us an anti-humane, communist organization. The U.S. needs to withdraw from it, stop all support of it. and evict all U.N. employees and ambassadors from the U.S.! We should have left them long ago. Richard K. from Fairhope, AL signed. Not one more dime of my tax money to this evil & corrupt anti-American organization. 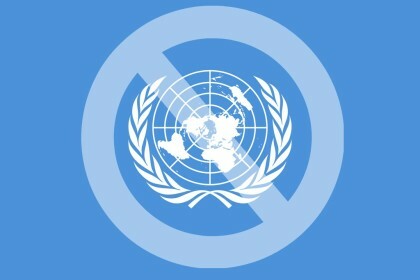 The U.N. is loaded with Dictators and Communists we need to stop funding the U.N. and tell them to get out of America ! This organization is anti-USA and Anti-Israel. Please explain why we are a part of it. And, further, why we foot the bill for them! We voted to bring America back to a Great Nation and it's a shame the democrats are trying as hard as they can to stop progress of happening. We need less government but a fully functional government so democrats need to help not hold America back. I want the democrats to let Trump have his cabinet so we can grow to a great nation once again. Democrats destroyed America for 8 years now tell the democrats to get off their asses and let freedom ring as it should be. God Bless DJ Trump our PRESIDENT!!! Brad S. from Muenster, TX signed. Simple: Being a member of the UN is not in our best interest! Jack N. from Bluefield, WV signed. It is time For the legislative branch to do their jobs. The Dems & RINOS need to Work as hard as POTUS to MAGA1. It's time that You do what the voters voted for. USA, Legal Citizens, VETs 1st! Quickly Approve Cabinet members NOW. Allow POTUS to implement His agenda and if the people do not like it allow them to make the decision. Confirm the President's cabinet, build the wall and deport illegals, reduce our taxes, repeal and replace Obamacare, take care of our vets! Do your DAMN job! If you are a patriot and love the United States of America you will vote to withdraw our great nation from the "globalist" United Nations. That entity has turned from a compassionate venue to a demanding, feral, unity of great proportions. We as a great nation should not be "hog-tied" to such theory. It sounds compassionate, yet is exactly the opposite, it puts unethical people in power over vulnerable peoples. Let our responsibility be to the citizen of United States of America, where we have the protection of a wonderful constitution. We have our own cancer amongst us. Our own people want to devalue our glorious constitution. If we have to "go it alone", so be it. We have God and our founder's wisdom to guide us, not the uneasy, changing public opinion spun by the main-stream-media to derail us. They less intelligent "want" to change us from a strong country to a mid-way influential country of "yes-men and yes-women" to their "ideal of humanitude". Well, have nothing to do with this organization, in fact, KICK them out of the US of A for good!!!!! GO DONALD . . . US GOOD GUYS ARE WITH YOU 100% . . The Texas voters who you unto office want you to follow the constitution and conservative values over your personal opinions and desire to be re-elected. America first. America! The UN is slanted against the USA and Israel. The USA needs to withdraw and remove our financial support. The U.N. must be prevented from taking our Constitution away from us. Mike D. from Crowley, TX signed. Thor M. from Strafford, VT signed. arvis s. from Petal, MS signed. jim S. from Lombard, IL signed. Get off the Presidents back. he is the President because we elected him not you (remember you are an also-ran). Remember that or we the people won't forget the next time you come up for re-election. Come on Congress. Both side work for America. Stop bickering and Work together!! Very tired of the democrats trying find something the Trump people might have done to make them so terrible that they are not fit to serve our country. HOG WASH We must start to govern. Never understood why we send money to foreign countries when we have so many veterans and homeless here in the US. Take care of our needs first. Someone from Hometown, IL signed. It is time to legally and financially disassociate with those nation states who repeatedly violate individual liberty. Richard H. from Sidney, IL signed. This organization has outlived its usefulness if it ever had any. We need to stop supporting those who oppose us. Get us out.